I made this necklace after a trip to Okinawa last summer. Wearing it always reminds me of the fun times I spent there. Of hanging out at the beach with good friends, the sand and the sea. The colours in this piece have a summery feel that makes me think of the beach at sunset and that first lone star that you glimpse at twilight, shinning brightly like a jewel in the sky. The sea in Okinawa is incredibly blue and changes colour throughout the day like a chameleon. In the early morning, it's full of soft blues and pinks. During the day, it transforms into a gradient of aquamarine and cerulean that contrasts with the white sand. Then, as the sun sets, the water changes again into a mysterious mix of indigo, orange and purple. I bought the parts for this necklace at Rollo in Kobe. (I'll be posting about this shop and my trip to Kobe soon!) The button is French antique and made of plastic that's been painted blue. I love it's colour and glossy finish! The gold star, which I glued to the button, is stamped in what I think is brass. The red-orange glass bead has subtle swirls of colour inside the bead that you can only see when you hold it up to the light. To connect the pieces, I attached two metal plates to the back of the blue button so I could hang the bead from one side and attach a gold chain to the other. 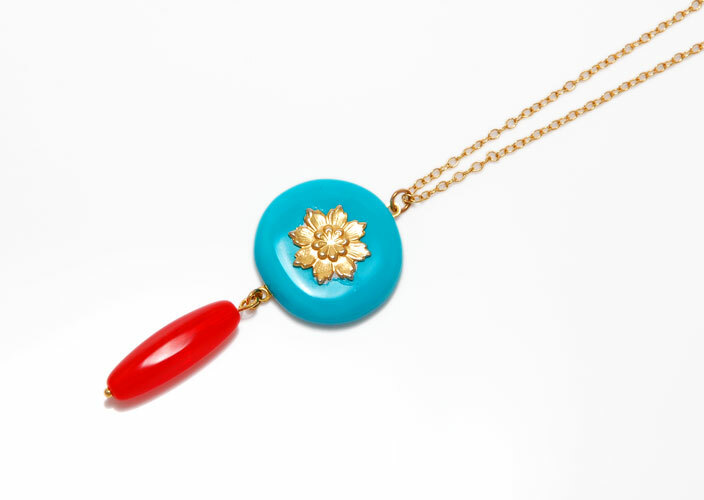 And somehow, the contrasting colours in this necklace actually complement each other. Do you have any summer jewellery that reminds you of a faraway place or a happy holiday? I'd love to hear from you! When I was a kid, I learnt to play the piano. I wasn't a very good student because I didn't practice enough. But I did like to open the piano lid sometimes to look inside. I thought there was something really beautiful about the way the keys were nestled next to each other. It seemed kind of magical that a bunch of keys and wires, held together at just the right tension, could create all those different notes and sounds. So I've called this necklace The Blue Key because it reminds me of piano keys sitting side by side, waiting to be played. I love the shape and 3D chunkiness of the button. It also feels lovely to hold! I think the button might be made of some kind of plastic like melamine. It looks like it could have been carved by hand and then finished with a glossy cerulean blue paint. I also love the small white details left on the edges of the button because they really enhance it's geometric shape. The button is French antique from Rollo and I think it's one of those perfect pieces that doesn't need anything added or taken away to make it into jewellery. The pendant was very easy to make. I simply I glued a metal plate onto the back of the button so that it would hang diagonally. Then, I added some silver squares along the length of the silver chain so that when you wear the necklace, they catch the light and reflect the shape of the button. I think this button would also make a lovely ring too! What do you think?